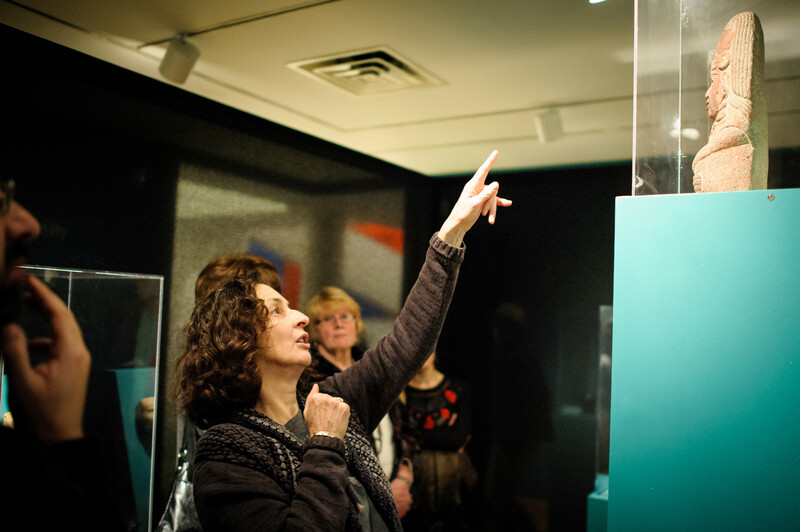 Interdisciplinary expertise takes shape in our galleries. We collaborate with faculty to give physical and visual form to research and ideas. Together we generate projects that include exhibitions, programs, installations, and publications. Chair and Professor of Anthropology Antonia Foias gives a tour of The Seeds of Divinity. The Seeds of Divinity is curated by Antonia Foias, Chair and Professor of Anthropology together with her Anthropology 281 class, Hadley DesMeules’16, and curator of Mellon academic programs Elizabeth Gallerani. Exhibition design by David Gürçay-Morris, Associate Professor of Theatre. This exhibition included generous loans from the Worcester Art Museum and the Yale University Art Gallery. Pre-Columbian civilizations in Central America used the human body as a prism for understanding and depicting the supernatural. Artworks from the era portray a human head emerging from the jaws of a monster, the transformation of bodies into divine beings, and passage into the afterlife. Objects from five Mesoamerican civilizations—Maya, Teotihuacán, Nayarit, Zapotec, and Aztec—explore the spiritual and the sacred, plumbing the mutable line between humans, gods, and animals. The Seeds of Divinity exhibition grew from a robust, three-year collaboration with the Worcester Art Museum (WAM), designed to leverage the strength of WAM’s collections together with WCMA’s capacity in working with faculty and students to teach with art objects and develop exhibitions based in primary research. examine Rauschenberg works from the WCMA collection. 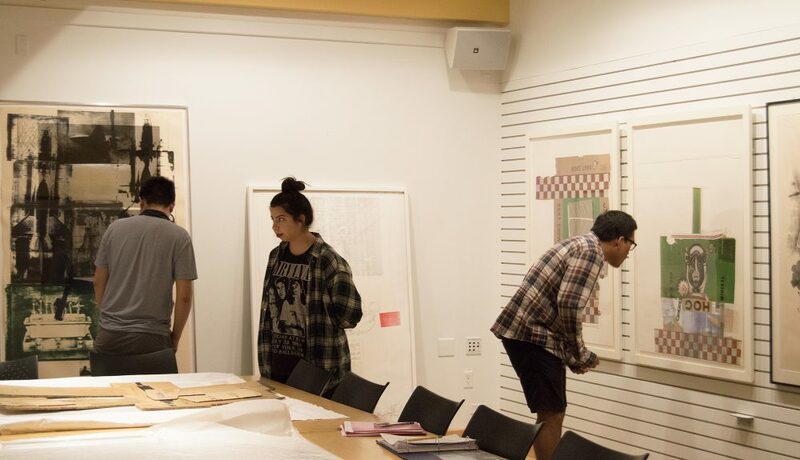 Robert Rauschenberg: Autobiography is organized by curator of contemporary art Lisa Dorin, professor of art C. Ondine Chavoya, and the students from fall 2016 Art History 319. Rauschenberg’s monumental print, Autobiography, 1968 is the centerpiece in an exhibition that brings together 26 original works of art with 56 archival objects primarily on loan from the Robert Rauschenberg Foundation. It is the first exhibition to make use of the artist’s extensive archives, newly accessible through the Rauschenberg Foundation. Students in the fall Art History 319 course, led by curator Lisa Dorin and professor of art C. Ondine Chavoya researched the artist’s life, work, and the often blurry intersections between the two. Their investigations culminate here in a thematic exploration of the artist’s use of his body, performance collaborations, love of animals, and interest in technology. African Art Against the State, 2016. Photo by Arthur Evans. Curated by professor of art Michelle Apotsos with curator of contemporary art Lisa Dorin, African Art Against the State highlighted the history of activism, intervention, and resistance that has characterized a great deal of African art-making from prehistory to the present. Michelle Apotsos taught a winter study course that addressed the methods of creating an effective exhibition space for the arts of Africa. Students read foundational texts on African art and the history of its display in Western museum institutions and discussed the issues and politics of these ventures. They turned these conversations into practice by organizing and installing a section of the exhibition. An art history course followed in the spring which took students through the history of mediation, activism, protest, and resistance as it has unfolded within the arts of Africa. We work closely with faculty from development of the initial concept through installation. Contact Lisa Dorin to learn more about the process.